REGINA, Aug. 16, 2018 /CNW/ - Input Capital Corp. ("Input" or the "Company") (TSXV: INP) (US: INPCF) is pleased to announce the Declared Regional Price ("DRP") for marketing stream contracts for the 2018 crop season. The DRP for 2018 canola sales was set yesterday at $494.80 per MT, FOB Farm. The DRP is the final reference price in the calculation of how much farmers receive for the canola they have contracted to sell via Input's marketing stream program. For crop grown in 2018, this means that marketing stream clients will receive a final price of $480.06 per MT ($10.89 per bushel), with Input organizing and paying for trucks to pick up the canola from the farmer's farmyard. By comparison, the elevator price at Balgonie, Saskatchewan, at the close of business yesterday, was $452.52 per MT (or $10.26 per bushel). To get that price, the farmer would be required to complete the trucking at his/her own time and expense. This means that for every 42 MT semi-truck load of canola grown in 2018 and sold via Input's marketing stream program, producers will put an extra $1,576.68 in their pocket, plus save themselves the time and effort required to drive the truck to the elevator themselves, and sit in line to complete the delivery. 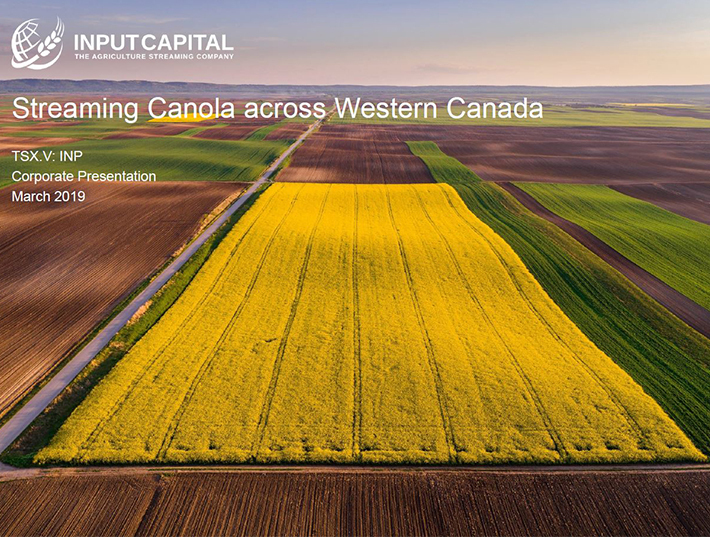 Gord Nystuen, VP of Market Development at Input Capital commented: "The Input Capital marketing stream program offers excellent value to producers, helping them get a better price via Input than they often get on their own, with the added benefit that Input's team of canola marketing professionals manage all of the logistics, marketing, contracting, and hedging required to run the program successfully." Input has 274 canola marketing stream clients across western Canada and invites canola farmers who are interested in a simple and straight-forward canola marketing program that helps them make more money to contact their local Input Capital marketing stream representative for more information about this program. A listing of Input reps can be found on the Input website at http://inputcapital.com/our-team/.